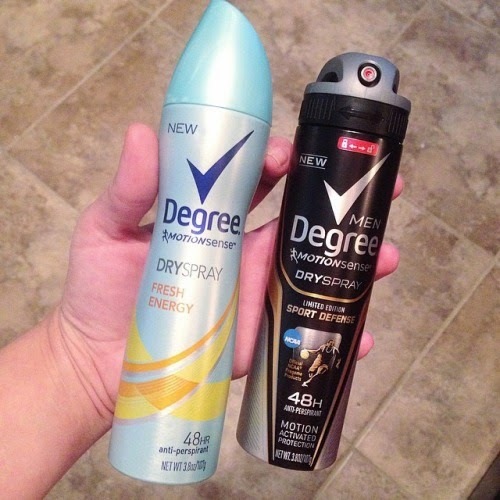 NEW Dry Spray Antiperspirants from Degree Men, Degree Women, Dove, Dove Men+Care and Axe, available at Walmart. If you have not tried these dry spray antiperspirant yet you are totally missing out ! These here are the Women's and Men's Degree Motion Sense versions. These two are the newest ones in our collection. Yes, I said collection. Is it weird that I have several of these in all different fragrances? Why do I like them so much ? I love how this goes on super fast and is instantly dry. I like that I can just spray it on walk to the closet and get dressed right away. I don't have to wait for it to soak in or 'set'. No rub off on my clothing or staining in the armpits of my shirts. 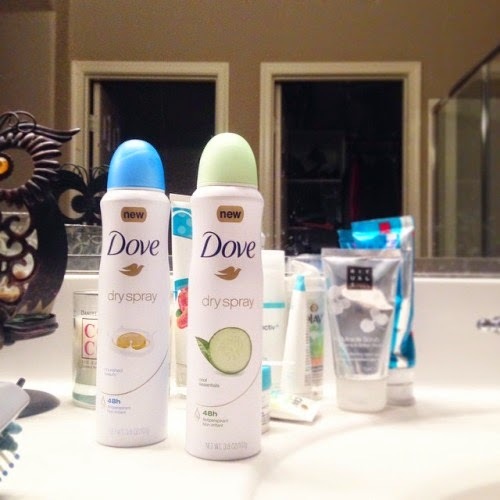 I have repurchased the Dove Dry Spray's pictured above. I've been using the Dove ones since November 2014. I think I have a decent grasp of whether I like it or not. And I like it ! I think I prefer the type of spray nozzle that is on the Dove bottles verse the Degree one. Both 'do the job'. It is just more of how it comes out of the can. Definitely more of a nit picky thing. I have not had any skin rash issues with using any of these as I have had in the past when switching antiperspirants. These claim to have a 48 hour window of protection. I have not pushed it that far as I shower every evening. But I will say that I wear these on days that I work. Naturally at work I am running around and get a bit sweaty. That being said I haven't had any mishaps of stinkiness when using any of these. These dry antiperspirants are pretty much the coolest and most useful revamped / updated product I tried lately. What are some of your favorite daily care products ?